The Plymouth energy producer has one of the worst records in the country. That’s raising questions about what happens after it closes in 2019. The Pilgrim Nuclear Power Plant in October 2015, after Entergy announced the plant would close. She drove past a second rusty gate, the splintered nub of what had once been a wooden barrier arm blocking admission to the facility, and a number of “No Trespassing’’ signs into a parking lot north of the plant. She made some lazy circles around the lot and an enclosure containing several natural gas tanks. Then the 63-year-old Harwich resident and executive director of the citizen action group Cape Downwinders parked her car next to the fence separating her from the plant’s reactor and waited for a guard to shoo her away. Turco was surprised when 30 minutes passed and no one seemed to have noticed her — she’d once been arrested during a demonstration for inadvertently stepping onto Pilgrim property. She got out of her car and walked to the fence, then hopped up on a concrete embankment and waved at the security cameras. She took pictures of the squat, square reactor building. She stretched out on the retaining wall and pretended to sun herself. Turco got back in her car and drove to the plant’s other entrance. It had a guard shack, which was empty, so she drove past it and pulled up alongside the front entrance. She’d been inside the plant’s gates for almost 50 minutes and no one had so much as frowned at her. So she called the Plymouth police and told the captain on the other end of the phone her concerns about the apparent lack of security at the plant. She reminded him of the spent fuel rods on the property — tens of thousands of them, accumulating in cooling pools for decades, waiting for the government to honor a promise to store them safely, someplace else. Contacted later, Plymouth Police Chief Michael Botieri at first said there was no way Turco could have made it past the guard shack, since it was staffed. After I explained that I had accompanied her, he called Entergy and reported back that the guard shack was indeed unstaffed that day. Neil Sheehan, a spokesman for the Nuclear Regulatory Commission, which oversees the nation’s nuclear energy producers, says he certainly doesn’t love that Turco got so close to the entrance of the plant. But he’s confident that even someone with malicious intent wouldn’t be able to do much damage. Reactor buildings are designed with multiple layers of security and fail-safes and have to pass “force on force” security inspections (simulated commando-like attacks) to stay licensed. Pilgrim is in good standing in this regard. But if Turco and I can have an excellent adventure leading up to the front door of the Pilgrim plant, it raises at least two questions: Just how secure is the plant? And how safe are we? Pilgrim has, after all, seen a series of safety and procedural violations that in 2015 landed it on the NRC’s watch list — or, in the bureaucratese, the “Multiple/Repetitive Degraded Cornerstone Column.” Also known as “Column 4,” due to the five-column rating system the NRC uses in its reactor oversight process, it is not a list anyone wants a nuclear plant to be on. The next stage, Column 5, means the plant could be shut down. 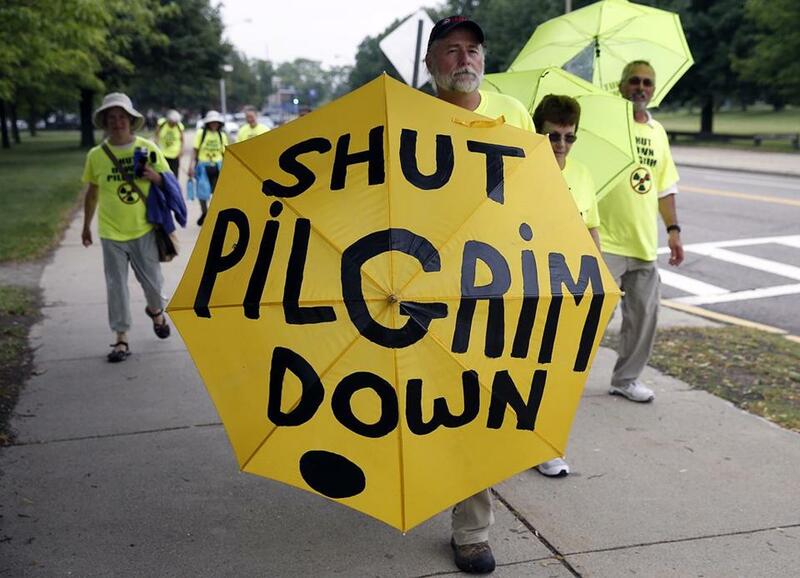 Pilgrim is, of course, going to be shut down regardless: Entergy Corp., the New Orleans-based energy giant that owns Pilgrim and eight other nuclear power facilities, said in October 2015 that the plant was no longer financially viable. Last year, it set May 31, 2019, as the date by which it would stop producing power. Activists like Turco can’t wait. “If Pilgrim were a preschool, it would already be shut down,” she says. But those spent fuel rods will still be on the site — the federal government has been unable to fulfill a 30-year-old promise to safely store nuclear waste, though it approved building an entire repository in Nevada’s Yucca Mountain. The facility never opened, and the Obama administration cut its funding in 2009 (the Trump administration wants to revive it). For the foreseeable future, Entergy will still have to manage those rods. And that gives Turco and others pause. Activists march from Plymouth to the State House in June 2015. Entergy will continue to invest in maintenance, says Patrick O’Brien, a company spokesman. He says Entergy has spent hundreds of millions of dollars improving Pilgrim’s safety, reliability, and security. “Entergy will always spend what is required to ensure the safe, secure, and reliable operation of Pilgrim, as well as to demonstrate that the plant is run safely,” O’Brien says. THOUGHTS OF A SHUTDOWN were scarce when Entergy bought Pilgrim from Boston Edison in 1999, the country’s first sale of a nuclear power plant. Entergy paid $81 million for a plant that cost $231 million to build in 1972 and was producing just 3 percent of the state’s power. But a newly deregulated marketplace meant companies like Entergy could charge market rates for their output, and oil prices were at the start of sustained increases driven by fears production had peaked, which was raising demand for renewable energy sources. In 2006, Entergy successfully applied to extend its license for Pilgrim, due to expire in 2012, until 2032. Since the plant opened in 1972, it has been a significant part of the Plymouth economy, once providing about half of the town’s total tax base. That’s down to about 5 percent now, but its 600-plus workers earn about 50 percent more than the state’s average income, with excellent benefits. Plus, Entergy contributes about $200,000 each year to the Plymouth community, supporting everything from a local orchestra and Fourth of July parade to the hospital and at least one elementary school. “They are good corporate neighbors,” says Ken Tavares, chairman of the board of selectmen for Plymouth. But Tavares says he worries about the plant. It isn’t because losing it will hurt Plymouth’s economy and Massachusetts’s goals for emission-free energy production. (Pilgrim’s electrical output now equals about 17 percent of the state’s needs, or about 80 percent of our emission-free energy.) What gnaws at Tavares and others — including both US senators from Massachusetts — is more existential: They’re afraid that Pilgrim could suffer a catastrophic failure before then. And some industry insiders say their concerns are valid. Those repeat failures landed Pilgrim in Column 4 and drew heightened attention from elected officials, including US Senator Ed Markey, who has long expressed concerns about the reactor. 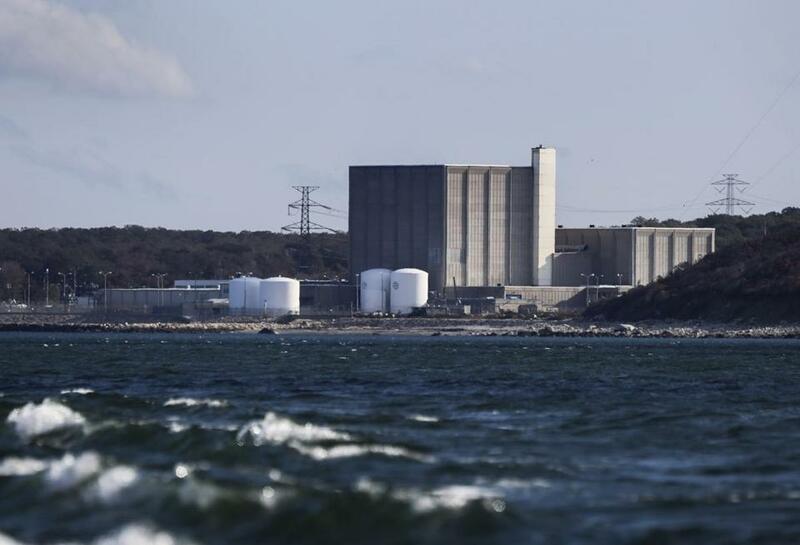 “Pilgrim Nuclear Power Plant has one of the worst safety records of any nuclear facility in the country,” Markey said in a statement e-mailed to the Globe. He also said he’s worried about Entergy’s ability to operate the plant safely and what a nuclear accident would mean for the surrounding communities. Entergy says it operates each of its nuclear plants safely and securely and in accordance with NRC regulations. 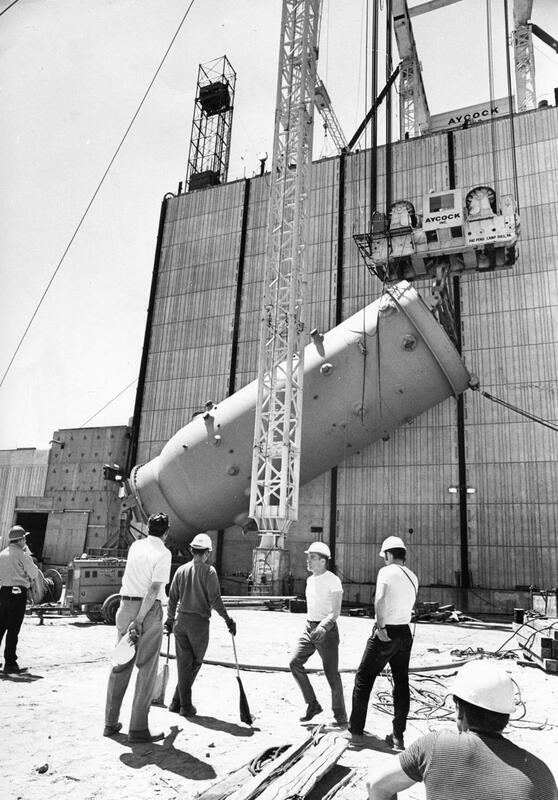 Pilgrim’s 512-ton nuclear reactor is hoisted in May 1970. It may not be literally true that all Entergy’s plants rank at the bottom, but there are currently two nuclear plants in Column 4: Arkansas Nuclear One, and Pilgrim. Both are owned by Entergy. Since 2000, NRC has placed 10 plants in Column 4. No other company has had a plant in it more than once. The NRC has pointed out plenty of issues at Pilgrim. After a nuclear facility is placed in Column 4, that plant must submit to a three-phase inspection process known as a 95003, in which a team of NRC staff members looks for additional safety concerns. One phase of the Pilgrim inspection found a series of safety violations in its lowest-risk category, green. The most serious involved a gearbox on one of the plant’s two diesel-powered backup generators. Entergy replaced it in 2000 but didn’t properly account for a relief valve on the replacement gearbox, which eventually allowed oil leakage that could have caused the valve to stop working. Because the other generator was periodically shut down for maintenance, the NRC concluded that the plant may at times have been running without backup power. The NRC originally designated this violation “greater than green,” but earlier this month it reduced the severity to green after a third-party vendor performed a series of lengthy tests on a model gearbox and presented those findings at a regulatory conference. The vendor argued that the generator in question could have continued working even with the low oil level. NRC inspectors also had determined that management failed to prioritize safety evaluations of equipment. Plant operators assumed, rather than confirmed, that equipment was running well. An unrelated third-party inspection found a 38-inch gap in a Boraflex panel inside a spent fuel storage rack. Such panels prevent the spent fuel rods from fissioning, which could boil off water that cools them, creating the possibility the spent fuel could catch fire and release radioactive material into the atmosphere. It also found potential for similar gaps in 885 other panels. These should be replaced, or the spent fuel should be moved to a safer storage option. Entergy has a September deadline to resolve this issue. Meanwhile, other problems persist: Between June 2012 and June 2014, a Pilgrim security officer failed to conduct more than 200 mandatory hourly fire watches and then fabricated records to make it seem as if those watches had occurred. In the spring of 2016, a series of mistakes made by technicians caused one of the plant’s coolant systems to shut down for a time. 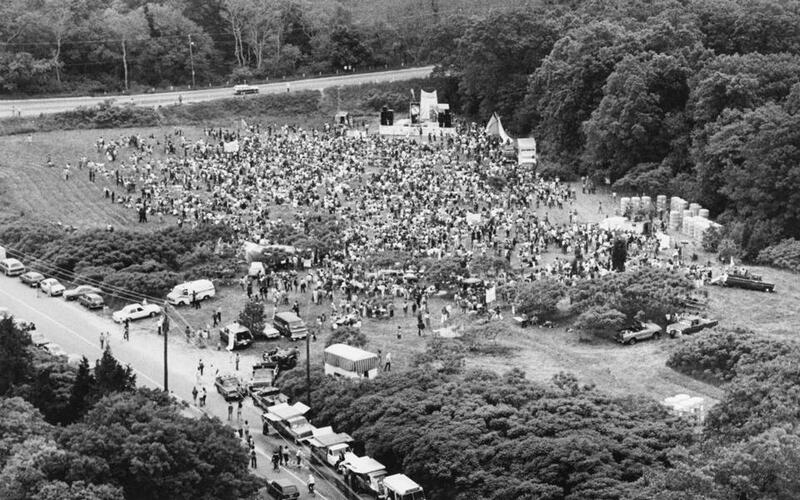 Demonstrators in Plymouth protest nuclear power in June 1979, several months after a partial meltdown at Pennsylvania’s Three Mile Island Nuclear Generating Station. Most recently, a special investigation found that at least one Pilgrim employee helped another enter the plant without proper identification — a practice known as “tailgating” or “piggybacking.” One of the employees interviewed by NRC investigators said that the practice was both tolerated and even sometimes encouraged by security officials at the plant. Blanch, the consultant, says the tailgating issue calls into question NRC practices as well. “This event occurred more than a year ago, and the NRC finally acknowledges a serious breach of nuclear security,” he says. The NRC’s Neil Sheehan says its investigation into the incident was never intentionally hidden from the public — it was posted on an NRC listserv and even received media coverage. The same can’t be said for an internal memo about the 95003 inspection authored by Don Jackson, branch chief of the NRC Region 1 Division of Reactor Safety. The memo was e-mailed in December to the members of the NRC inspection team — and by mistake to Diane Turco. She forwarded it to the Cape Cod Times, which published a story about it. In the memo, Jackson notes weaknesses in Pilgrim’s corrective action program and its “somewhat disjointed” execution of provisions, like the security supervisor who “forgot” to mention a safety culture focus group Jackson wanted to conduct, meaning no one showed up for it. Jackson’s report suggested that, while people wanted to do a good job, “many staff across the site may not have the standards to know what ‘good’ actually is.” Jackson concluded employees seemed overwhelmed. The NRC downplayed the memo, calling it “preliminary,” and Jackson said at a public meeting that he meant they were overwhelmed by the initial demands of the inspection. But in an interview for this story, Jackson said he definitely saw “a safety culture problem” at Pilgrim and “an organization that was early in their journey toward improved safety culture.” Maybe, he added, Pilgrim and its owner would get there in three to five years. The problem, of course, is that the plant is set to close in less than two. EARLIER THIS MONTH, the NRC released a report outlining the corrective steps Entergy needs to take for Pilgrim to move up from Column 4. Broken down into seven categories, the majority address the safety culture and “human performance” at the plant. That’s particular cause for concern, say watchdogs like Paul Blanch and Dave Lochbaum. It was human error, after all, that caused meltdowns like the one at Pennsylvania’s Three Mile Island in 1979. Maybe, says Lochbaum. But he worries that Entergy’s spotty safety record could exacerbate risks posed by natural disasters. In an era of global climate change and weather events like Superstorm Sandy, there is real potential for a storm surge significant enough to cause an unplanned shutdown requiring the use of Pilgrim’s backup generators. What if both were offline? He concedes that the odds of a quake capable of disrupting Pilgrim are low — about 1 in 15,000. Still, he says, that’s no reason not to take action, particularly given Entergy’s track record. 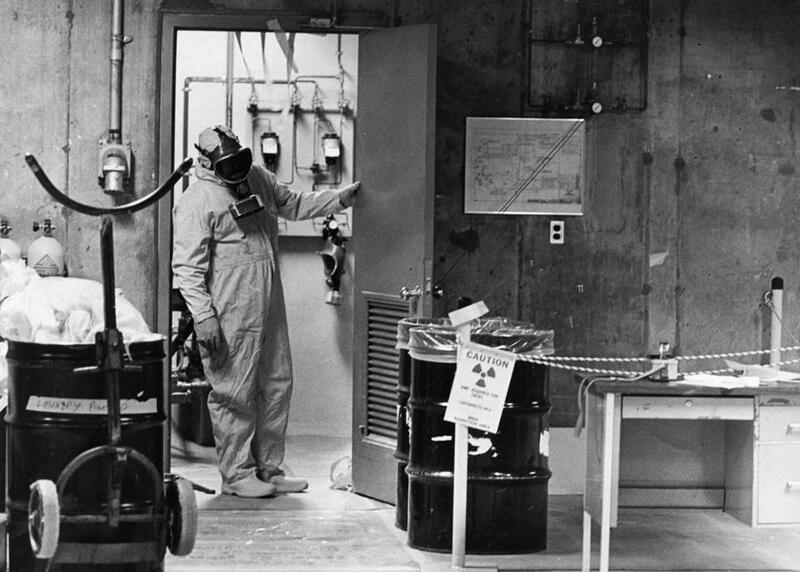 A Pilgrim plant employee wears protective garb to work in a radiation area in 1975. The spent fuel rods are of particular worry. “The overcrowded spent nuclear fuel pools at Pilgrim Nuclear Power Station are a disaster waiting to happen,” says Markey, who asserts that Pilgrim’s spent fuel pool contains nearly four times the amount of radioactive waste it was designed to hold. Markey opposes the Trump administration’s plan to open Yucca Mountain and is pushing legislation for new storage areas. We will see in September how Entergy will resolve the issues with its spent fuel pool, at least for now. At Pilgrim, Entergy has installed some dry casks to handle long-term storage. The casks weigh more than 100 tons when loaded and are designed to withstand submersion. For their part, activists like Diane Turco of Cape Downwinders fear that as long as there are significant sources of radioactive material on site, there is the risk of a meltdown or major radiation release. If such an event were to happen, NRC protocol mandates immediate evacuation of people within a 10-mile radius of a plant. There are more than 93,000 people living in the radius around Pilgrim, a number that grows dramatically during the summer. For those outside that 10-mile radius, the Massachusetts Emergency Management Agency disaster plan recommends they shelter in place. Some 4.7 million people live within a 50-mile radius, including the residents of Boston and Cape Cod. Turco says Cape dwellers will be stuck, since in MEMA’s emergency plan, the Sagamore and Bourne bridges — the only ways off the Cape by car — could be closed to traffic. MEMA spokesman Christopher Besse says the bridges are just two of many traffic control points meant to minimize paralyzing congestion, and sheltering in place would likely be for just a few days. Entergy still has to submit its plan for decommissioning Pilgrim and for managing those tens of thousands of spent fuel rods. Vermont Yankee, which it shut down in 2014, may be a model: It is in the process of moving the spent fuel rods to on-site dry cask storage. The NRC says it is up to Entergy to decide what it will do at Pilgrim. But until the federal government can execute a plan for storing spent nuclear fuel, there will be people concerned about Pilgrim. Correction: An earlier version of this story incorrectly described the Pilgrim station’s industrial sector, the status of a federal nuclear waste repository at Yucca Mountain, Nevada, and the time frame of falsified fire watch reports at the facility. Kathryn Miles is a writer and author in Portland, Maine. Her new book, “Quakeland: On the Road to America’s Next Devastating Earthquake,” comes out August 29. Send comments to magazine@globe.com. Follow us on Twitter @BostonGlobeMag.